We recently found ourselves in Menorca/Minorca on the Spanair error fare that was filed in June. 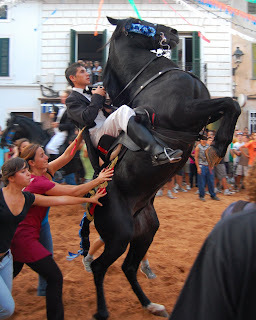 The town of Es Mercadel has an annual festival displaying ridership and control of horses, staged right in the modest town square. The parade of perhaps 30 riders concluded with the town priest performing as competently and calmly as every other rider. A fellow in front of me was mildly injured when he stumbled backwards and a horse stepped on him. The festival featured a delicious iced drink made with the island's gin and lemonade.